Jacquie Ottman is on a mission to change consumer culture in NYC. acquire things without shopping. Many would agree that shopping — and specifically, assuming we need to buy new whenever we need something, is one of the reasons why we have so much trash. Today I would like to ask what may sound like a heretical question to New Yorkers and indeed, all of us Americans: What Comes After Shopping? Alternatives to Buying New, Alternatives to Ownership. Thanks to the internet, new technology and good old thrift shops and other means, we don’t always need to buy new, and we don’t necessarily need to own many of the things we use every day. Given all the trash that NYC generates each day, and the myriad issues that surround it, including climate change, now is the time to talk about solutions. Roadmap. Before presenting my ideas, I’ll review why NYC’s Zero Waste plan is meeting some bumps along the road to 2030. And talk about why we need to come up with solutions beyond recycling. I’ll end with some ways for all of us to get meaningfully involved in our roles as residents, consumers, citizens, and leaders in our community. How Much Waste Do New Yorkers Generate? We New Yorkers generate 25,000 tons/ day of waste every day — to the tune of 6MM tons/ year. We generate half of this in our homes (“Residential Waste”). The other half (“Commercial Waste”) is generated by the city’s businesses — but indirectly by us, too — in the offices where we work, the restaurants where we dine, the hospitals that put us back together again, and in the bakeries that start in the wee hours to bake our morning bagels. Each of us generates nearly one ton of this waste per year. Who says one person can’t make a difference? 77% of NYC’s Residential Waste is Recyclable. However, only 17% of all of the city’s residential waste is recycled out of a possible 77%. Another 17% is incinerated (another story entirely!). So we have a long way to go to divert 90% or more of our waste by 2030! Pop Quiz: How many landfills do we have in NYC? Zero! How many incinerators? Zero! So all of our waste must be exported out of the City. Whatever is not recycled or incinerated in Newark, is landfilled upstate and in ten other states — to the tune of $420 Million/ year. a waste of our natural resources, and creates pollution from the time the resources are mined to make products, to the pollution that’s created to ship our disposables to a landfill and then to have toxics leach from landfills into underground waterways. Ethical Issues. The waste is shipped (mostly to poor counties) willing to take NYC’s waste for landfill, creating health problems, and affecting marine life, particularly from plastics that don’t break down on land or water. Financial Risk. The recycling industry is now in turmoil because of China’s ban on many recyclables. The states we’re sending waste to could soon hold us hostage. What programs will we need to give up if export fees rise to $1 billion by 2030 on the current trajectory — after school programs? the Arts? education? Climate Change. Just collecting and shipping NYC’s waste up and down the East Coast creates 2.2 MM tons of carbon per year. All that food waste and other organics we’re sending to landfills degrades into methane, a greenhouse gas that’s up to 25 times more potent than CO2. And when we throw stuff away, we’re throwing away all the carbon that’s embedded in products and food. Let’s look at that more closely. 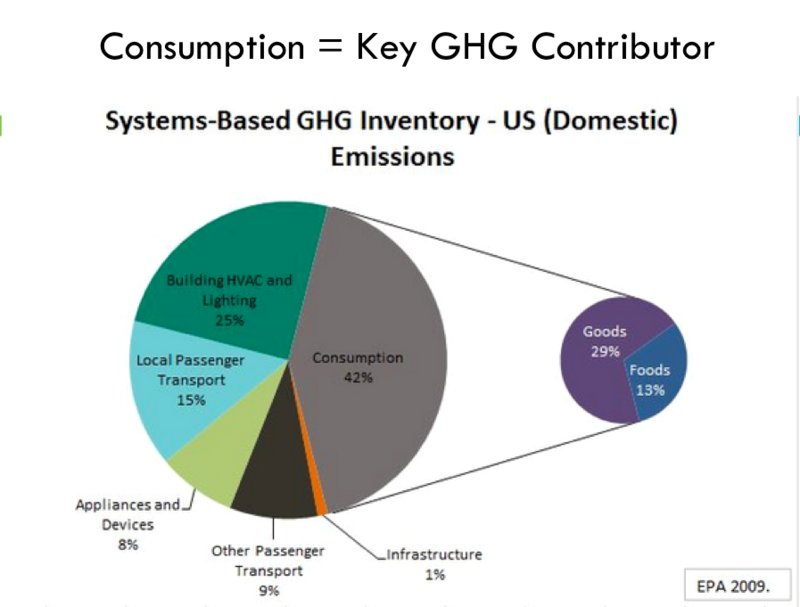 As the chart indicates, in 2009, the U.S. EPA estimated that the production of consumer goods and food generates 42% of greenhouse gas emissions. So, after switching to renewable energy, reducing our consumption — i.e., changing our consumer culture — is one of the best ways to address climate change as well managing natural resources and keeping waste to a minimum. 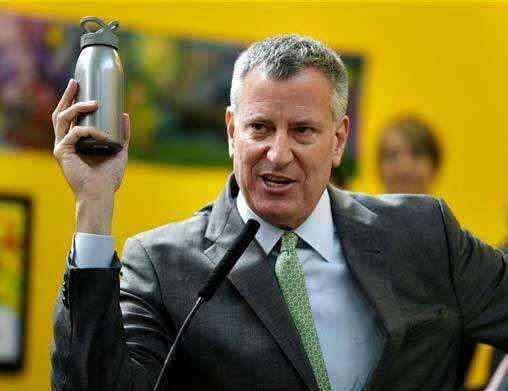 To address these various solid waste and related issues, and to put us on a path towards a new consumer culture, Mayor DeBlasio introduced on Earth Day in 2015, NYC’s Zero Waste x 2030 plan. Good for him! Good for us! That makes us the largest city in America with a Zero Waste plan, and puts us in company with other progressive cities like San Francisco, Minneapolis, Seattle and LA. Its goal is to divert 90% of solid waste from landfill by 2030. It’s an ambitious goal, (and as aspirational one) — but things are not progressing so well. Why? 1. A mixed record of progress on recycling. Further geographic expansion of the NYC curbside organics program is now stalled due to less than anticipated participation, and this affects economics. Recycling participation at NYCHA complexes is going slower than expected, as is recycling uptake within the NYC public school system. Collection of electronics waste is going well, largely driven by the New York statewide ban on electronics in the waste stream, in effect since January 2015. It is complemented by the city’s “E-Cycle” curbside pick-up system for e-waste in multi-family apartment buildings and various neighborhood drop-off programs. 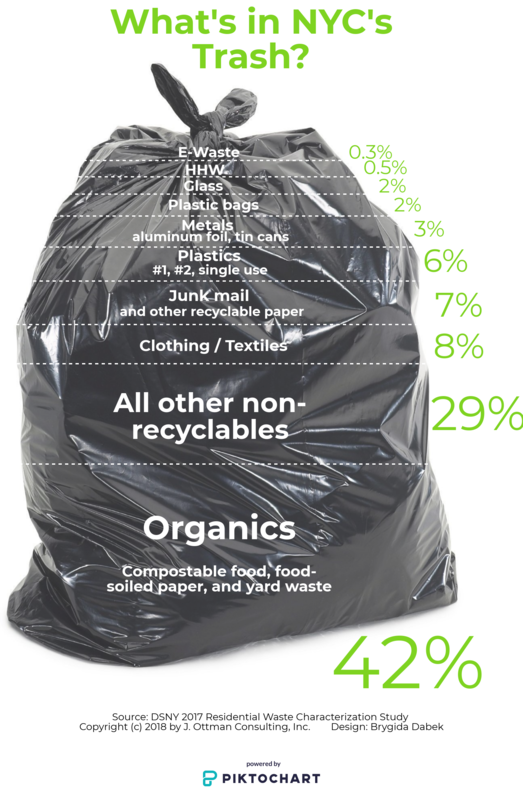 However, clothing recycling is not keeping pace with discards, hence the 8% of the refuse stream represented by clothing. Given fast fashion trends and recyclers that refuse clothing that is not reusable/ re-salable, expect this trend to continue. 2. Industry is not cooperating. Businesses work with an entrenched economic system that rewards constant growth and short term profits. And industry puts up a good fight when bans or fees come up in the legislatures. For instance, New York City and New York State still struggle against industry efforts to quash a proposed pass a ban or fee on plastic shopping bags. A ban on styrofoam was vigorously fought by industry for three years until it was recently upheld by a state judge. changing consumer habits around plastic packaging is important component of creating a new consumer culture. 3. Government has little no money for education and consumer culture change; meanwhile, massive advertising campaigns continue to fuel historical forms of consumption. 1. Learn more about equity issues within the five boroughs of New York, in Newark where our waste is incinerated, and in the states where our waste is landfilled. One North Brooklyn City Council district processes 60% of all of NYC’s waste and 70% of the organics. 2. Bring industry to the table, and specifically, promote the notion of “Circular Economy.” This can take the form of deposits and fees, bans and EPR (Extended Producer Responsibility) policies which would require industry to take back their goods for recycling, repair and remanufacturing into new goods. ‘Right to Repair‘ legislation has been introduced into the New York State Legislature as well as in 18 other states. 3. Put pressure on state and local lawmakers to align regulations and policies with Zero Waste goals. We changed culture around smoking and seat belts and we can do it with unnecessary consumption. Better integrating solid waste issues within the City Council might help get more traction for progressive zero waste policies. For instance, solid waste issues can be linked to climate resilience, health, environment, transportation, parks, and equity. 4. “Reduce, Reuse, and Recycle” in that order — in our own backyards, and influence others to do so. Recycling comes last because as a manufacturing process, it creates its own impacts. And, recycling doesn’t fundamentally change consumer culture — indeed, the fact that something like a Poland Springs water bottle is recyclable may give consumers ‘permission’ to continue to consume it as they always have. So we need to spend a lot more time thinking about how we can reduce waste and reuse more of what we consume. This will be the focus of the rest of my talk. 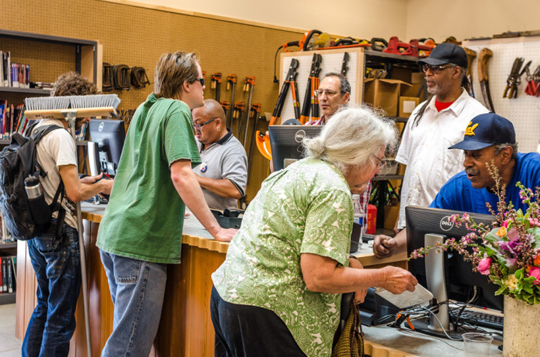 Tool Lending Libraries help communities cut down on unnecessary purchases. ction into our consumer culture. 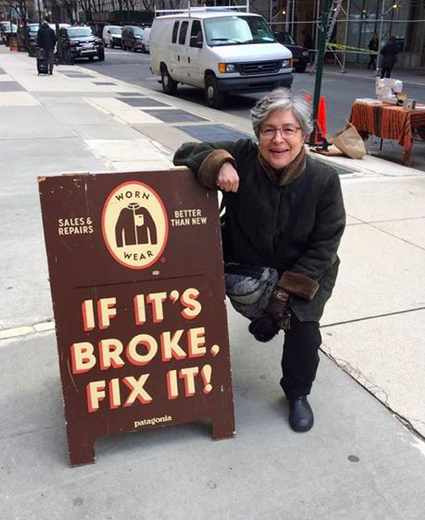 I see a particular opportunity here in NYC to change consumer culture by reusing more stuff within our own buildings and neighborhoods through ‘Sharing Economy’ strategies: Share, Swap, Borrow/Lend, Donate, Gift, Rent/Lease, and Buy and Sell things to each other. A great example is relying on tool sharing libraries rather than owning tools ourselves. Sharing Can Help New Yorkers Live Better. Think of the opportunities to get to know the neighbors! Sharing can also help people save money to spend on things that matter, like education, health care, and a secure retirement. Sharing instead of owning can help people declutter. And we wouldn’t have to go out of our way to lure folks with the prospect of ‘Saving the Planet’. They’ll be drawn in by the lifestyle benefits. I have been integrating sharing strategies into my own life in an the Upper East Side apartment building for nearly a decade. Here’s just a few examples of sharing that particularly intrigue me. 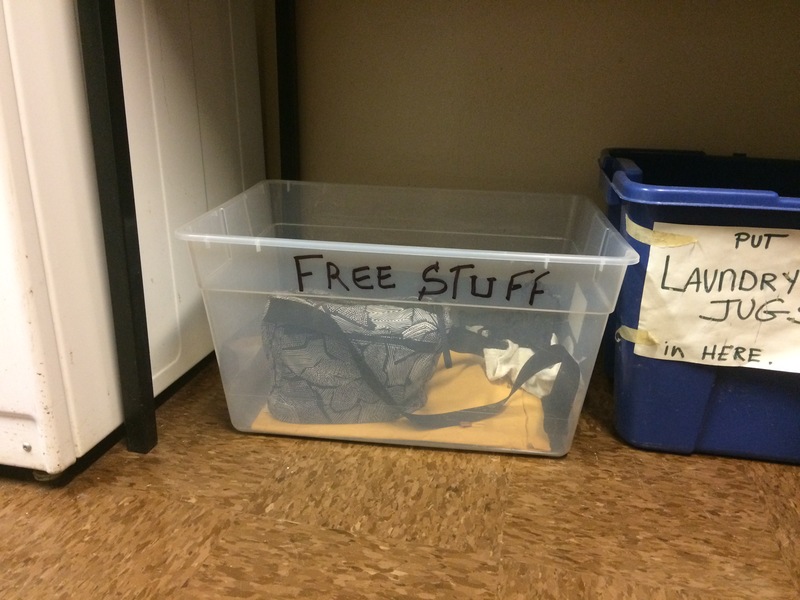 How about a Free Stuff Box or shelf?It’s a no-cost way to promote the transfer of goods among apartment dwellers, office-mates, senior center visitors and dormitory dwellers. Little free libraries. During the tours of residential buildings that I’ve been conducting for the Manhattan Solid Waste Advisory Board, I’ve been finding that many apartment buildings have a bookcase or shelf of books for all to share. Why not other things? Sacramento now has a Library of Things. Residents can borrow a guitar, sewing machine, cookie cutters, and many other things. Why not here in NYC? One day I’m going to walk into my 67th Street NYPL branch and borrow a pair of binoculars and a guide to the birds in Central Park. Why not share a vacuum cleaner with the neighbors? I predict that one day we’ll be sharing vacuum and other less often used durables in special closets in multi-family buildings. Last year, I put a note under every door on my apartment building floor letting neighbors know what I was willing to share. – Now Rita drops by every other Friday morning to borrow my Electrolux. Got food that’s about go to waste? Why not invite the neighbors in for a weekly “Leftovers Pooling Party” and create community by sharing recipes, and exchanging notes on the new restaurants and take out places we tried recently? Deposit extra food into a community refrigerator. Not up for a party? 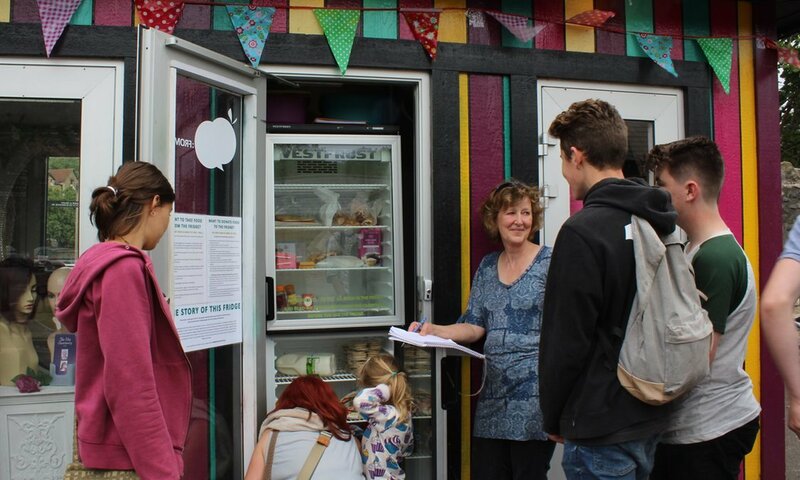 Community refrigerators are cropping up all over Europe and as far away as Saudi Arabia as a way of feeding the hungry. Think of the possibilities to save food in offices by devoting just one shelf in the fridge to sharing food that no one intends to eat. Just who’s moldy sandwich is on that back shelf No fridge? What about a Community Food Shelf of just dry goods?? So, you may be saying these ideas are great, but where’s the real impact? The impact comes when businesses see an opportunity to make money by bringing these ideas to scale. The genisis of Zipcar was an initiative of an environmental group in Germany. Now it’s all over the world – and all over New York because a businessman saw an opportunity to invest to make it accessible to everyone. Ebay is a yard sale on steroids. Rent the Runway is doing for prom and wedding dresses what the guys have always enjoyed via tuxedo rental. So that’s a few ideas. Let’s talk measurement. How To Measure Sharing Economy Impact on Consumer Culture Change? Reuse Index. Why not measure how much of our consumption is composed of items that we reuse instead of buy new? Think about all the items you came into contact with in the past 24 hours, including clothes. How many of these items did you buy new, and how many were previously owned by someone else? Sharing Index. What percent of all the products that we use in our households over the course of a month (or other time period) are not owned by us, but shared amongst others in our buildings, or borrowed from the neighbors? 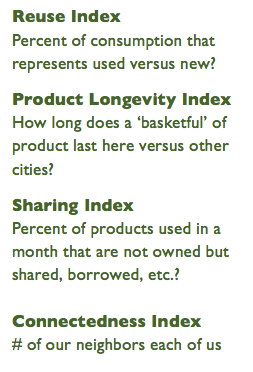 Product Longevity Index. In an era when much of what we buy lasts a maximum of six months (and some things for less than a minute), let’s measure how long a typical basketful of items that we buy here in NYC actually lasts. 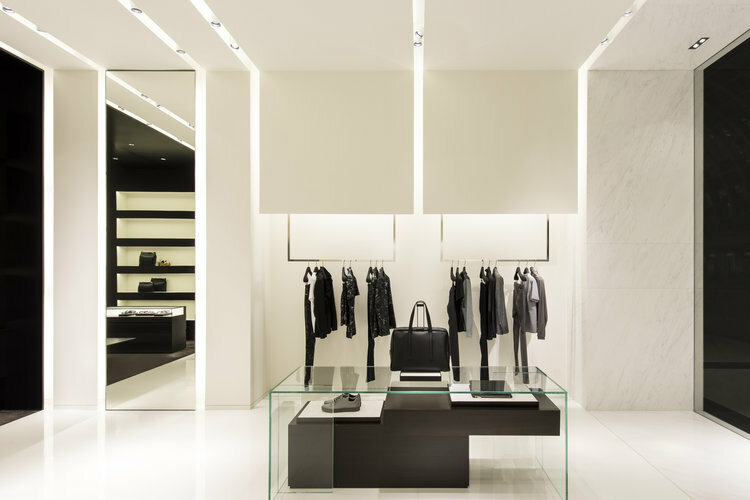 Product longevity is a function of the quality of what we buy, but it’s also how well we maintain our things, and the availability of repair services, as well as the will to wear our clothes just a little while longer or to buy more classic styles. Connectedness Index. How connected are we to our neighbors — the folks just on the other side of the wall, the folks we bump into on the street? Just how many of our neighbors do we interact with over the course of a month – or a year for that matter? Couldn’t we all use some more friends? Especially the millions of us here in NYC who live alone. We live in a very wasteful city; and our waste is creating many issues, including health risks, inequity and climate change. We have a Zero Waste x 2030 plan in place that needs attending to, or we will put ourselves at risk in the future. We can all do our part as individuals, as citizens, as consumers — and as leaders in our communities and buildings, to tackle waste, address climate change and help change consumer culture in NYC. We need to get up to speed on the issues, and work together with all sectors to make lasting change through policy and innovation. Sharing strategies can help us get beyond recycling. They can also help us to change our consumer culture and promote positive social change. 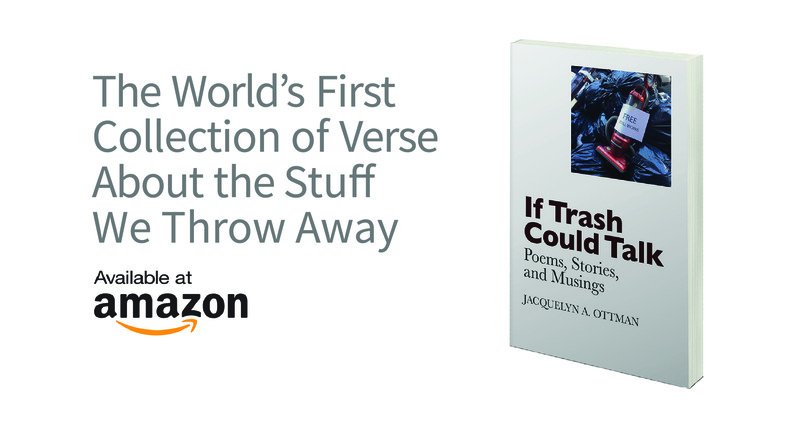 Jacquelyn Ottman’s new book, If Trash Could Talk, inspires a new consumption culture. One of these days the closet down the hall that’s now marked ‘Compactor and Recycling’ will be labeled ‘Sharing Closet’. The trash chute will be boarded up. The closet will be freshly painted, smelling like new. In that closet will be a Miele vacuum cleaner, an iron and ironing board, a 30 cup coffeemaker, a deck of cards, an espresso maker, and a toolkit. 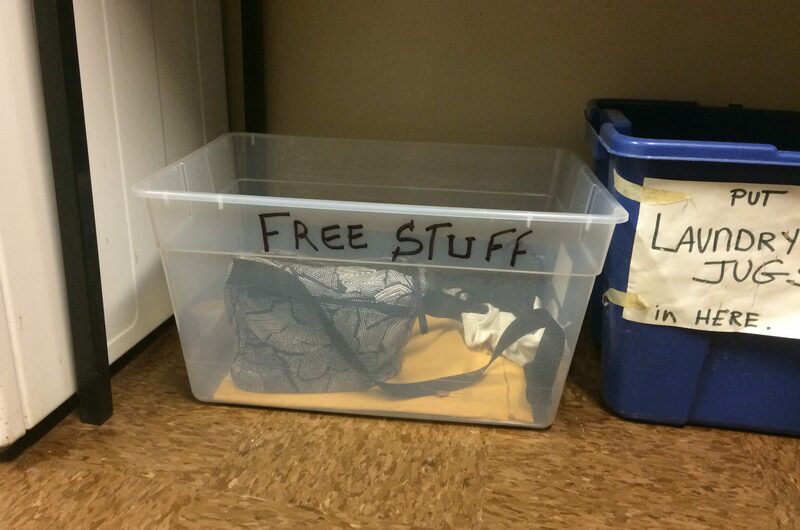 Residents will be free to borrow stuff as they choose, putting it back in a timely manner for others to use. The building — or Home Depot — will be responsible for maintaining the stuff. And everyone will say ‘Why didn’t we think of this sooner? Copyright © 2018 by Jacquelyn Ottman. All Rights Reserved. If you’d like to discuss any part of this, feel free to contact Jacquelyn Ottman at: info [at] we hate to waste . com or leave a comment below. I couldn’t believe that New Yorkers generate 25,000 tons/ day of waste every day. That blows my mind. What’s even more is the fact that there is a high percentage of compostable or recyclable material that gets overlooked and thrown in with the rest of the actual trash. I really enjoyed the image you have of the garbage bag and the break-down of what’s inside. It’s so true. Thanks for this eye-opening piece, with strong facts but also feasible solutions, that´s what we need right now! It´s fascinating to read this while the NYC Fashion Week is kicking off. There are so many opportunities for this industry to move into the sharing and/or circular economy and a lot of responsibility on our side as consumers. Changing consumer culture is more urgent than ever, it won´t happen naturally if we don´t have cooperation between the different sector. Still, I love the idea of empowering each of us to change! It’s interesting to think about New Yorker’s waste through an ethical lens, particularly with regards to waste being shipped to other regions or countries. I wonder how consumer habits would differ if the waste—the consequences of these habits—was instead processed in the neighborhood it originated in. If consumers were confronted with the amount of waste they generate, sharing strategies would certainly catch on widely and quickly! Given that this is not the case, I enjoyed your ideas of communal refrigerators and household appliances as easy ways to reduce waste. I love the idea of sharing household items like a vacuum with your neighbors! Not only does this help to save money and reduce consumption, but it also creates an environment where neighbors feel comfortable counting on one another- love it! I definitely agree with you on the need to bring industry to the table, especially through Extended Producer Responsibility. Trash is “out of sight, out of mind,” until the polluter takes some accountability. Enforcing fees or taxes on waste disposal, especially for consumers, would likely provide an incentive to produce less waste. This has been successful in Taipei City, Taiwan, where the government’s “trash per-bag fee collection policy resulted in a reduction of one-third of the garbage generated and a drastic increase in recycled trash. While similar policies in the west have not yet accomplished similar levels of success, these helpful tips on sharing, reusing, and prolonging product longevity are definitely opportunities that New Yorkers can attempt, which will surely increase future feasibility of an Extended Producer Responsibility policy in New York! I love the simple strategy of “Reduce, Reuse, Recycle, in that order”. I feel like most people skip the reuse step and just simply use, recycle, and forget. There are so many ways to reuse and repurpose different products, and many very fun projects to repurpose that could be found on Pinterest! It blows my mind how many people still don’t compost or properly recycle. I know Portland, OR mandates composting by picking up compost once a week and trash only once every other week. They also give out citations if compost is found in the trash! Hopefully this will spread to more cities soon!! In my experience, every apartment I have lived in in NY seems to have a different philosophy on recycling and sorts things to different levels. Some of the buildings I live in didn’t have separate cans for recycling/trash and didn’t separate by type of recycling. As a tenant, you can ask for more bins, clearer demarcation etc. but I think that if it isn’t there to begin with, most people probably aren’t going to ask for it. It would be helpful if the impetus to recycle started with the buildings. Maybe if people were incentivized to recycle stringently they would be more aware of how they are getting rid of it.